In recent days you might have heard of your friends asking you to download WhatsApp+ and you may have searched for the download link by googling it. I am writing this post to bring you the advantages and disadvantages of WhatsApp+ over WhatsApp. First and foremost, WhatsApp+ is a mod App created by the Spanish developer Rafalete in 2012. 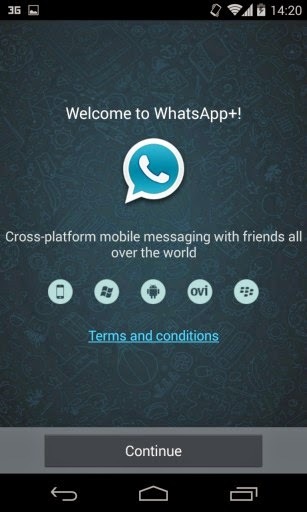 The WhatsApp+ or WhatsApp Plus Holo is free and uses the same user license as WhatsApp. The only outward difference is the WhatsApp+ icon which is blue in colour. WhatsApp+ is not a legal version of WhatsApp so you are at risk of data theft, contacts theft if you download it. It also requires you to remove the original WhatsApp to install WhatsApp+. Once you have removed your WhatsApp and installed WhatsApp+ here is what you will get. Themes : - The most notable feature of WhatsApp Plus is the ability to add new styles or themes to completely change the way your WhatsApp looks. If a WhatsApp+ user send the extra emoticon to a normal WhatsApp user, he/she will only see a empty box with a question mark in it. The other advantage WhatsApp+ had was to hide the users online status. This feature has now been incorporated in the official WhatsApp. Another WhatsApp Plus option lets you change the size limit of sent files from 2, to 50 MB. There are also options for maintaining the size and quality of images and videos.